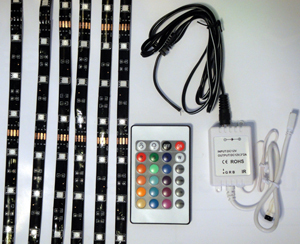 Size: 2-40", 2-20" & 2-8"
The all new Remote Control Accent Strip LED light Kit utilizes Hi-output wide dispersion flat LEDs, on a super flexable strip to give more light and maximum flexability for installation. Color changing LEDs give the ability to have any primary color, variations in between, change intensity, run programs (like flash, strobe, fade from color to color) and adjust the speed of blink, or just keep one color glowing. Infra red remote is super slim. Strips attach with 3M brand two way adhesive allows the strip to be mounted almost anywhere. Work on any 12 volt charging system. Wire connectors are included to route lights were desired and make installation easy. Comes with shrink wrap and color detailed instructions. Aptions include extra strips, cables, remote, and a 110 volt connector to run system in a home or office, like under glow on cabinets. Kit includes 2-40" strips, 2-20" strips 2-8" strips (6 pieces total), Remote Control, IR recieving unit, connector cables, mounting tape, shrink wrap and instructions.